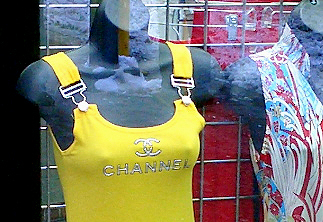 Complaint: Misspelling of the designer name “Chanel”; embroidery of said name on countless women’s shirts; still not noticing said error and placing it in a window display; wholesale distribution of a misspelled designer name; attempted copyright infringement. Defendant: Wholesale “designer” boutique on 37th Street. Report: Misspelled shirt beckoned to officer from across the street. Officer arrived on scene and witnessed a collection of misspelled shirts inside the store. An APB has been issued in an effort to get all such shirts off the street, as they could be emotionally devastating to anyone caught wearing one amongst people who can spell.